Japanese cooling expert Scythe launches the 5th Generation of its legendary Ninja CPU Cooler Series. Scythe bundles the Ninja 5 with two Kaze Flex 120 PWM fans which should offer a much more silent solution while still maintaining the high performance that you might expect from the Ninja Series. This has been achieved by mounting the two fans using the Push/Pull principle and setting the fan rotation limit to only 800 rpm. Outstanding RAM compatibility is assured even when used with LGA 2066 Mainboards with 8 RAM-Slots thanks to a new heatsink optimization. In addition to that, Ninja 5 is equipped with the third generation of the Hyper Precision Mounting System (H.P.M.S.) which further simplifies the installation procedure and supports all the major AMD and Intel sockets. The new Ninja 5 is equipped with dual fans that are high-quality Kaze Flex 120 PWM fans, whereas the predecessor had only one fan. 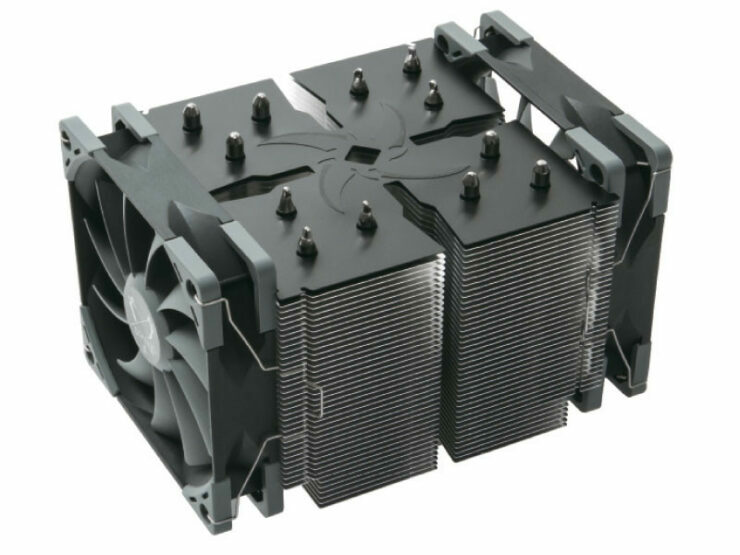 Delivering great performance at low noise levels is achieved by mounting the two fans in line, where the first one is pushing the air into the heatsink and the second one pulling it out. Both fans support the PWM function and can be controlled using the motherboard’s fan controller in the speed range from 300 to maximum 800 RPM. Thanks to this low fan speed range, virtually inaudible noise levels from 4 to 14,5 dBA are accomplished which should be nearly ambient room noise. The Kaze Flex 120 PWM fan series features a long lifespan of 120.000 hours (MTTF) and really quiet running thanks to the high-quality Sealed Precision FDB. Shock absorbers made of rubber are located in the corners of the fans to prevent the transfer of any vibration. The heatsink design of Ninja 5 has been tweaked during development. While the new all black top fin layer offers improved aesthetics matching most systems, the shortened six fin-layers on the bottom of the stack are assuring great compatibility to RAM modules. Thanks to the gaps, which are implemented on two sides of the heatsink, Ninja 5 is able to offer outstanding compatibility to RAM modules with a total height of 55 mm. 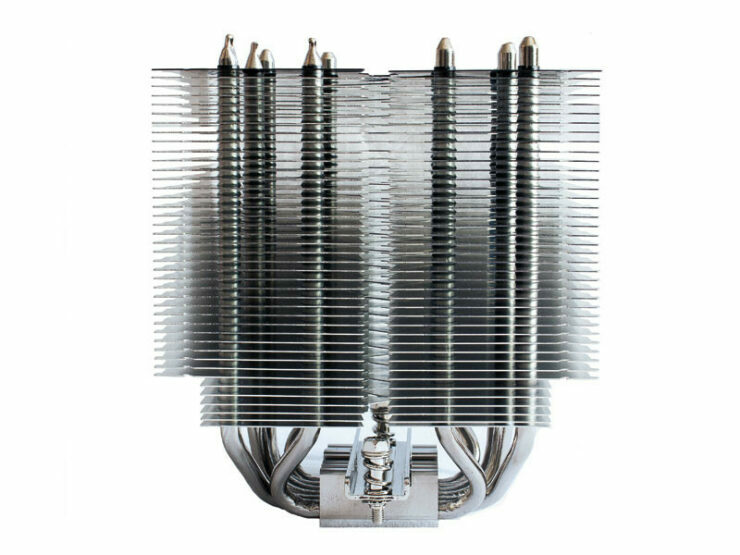 Fast heat transfer from the nickel-plated copper-base to the aluminum fins is achieved by utilizing total of 6 high quality copper Heatpipes, which are nickel plated as well. The socket compatibility list features the Intel Sockets LGA775, LGA1150, LGA1155, LGA1156, LGA1366, LGA2011, 2011-v3, LGA2066 and AMD Sockets AM2, AM2+, AM3, AM3+, FM1, FM2, FM2+ as well as AM4. 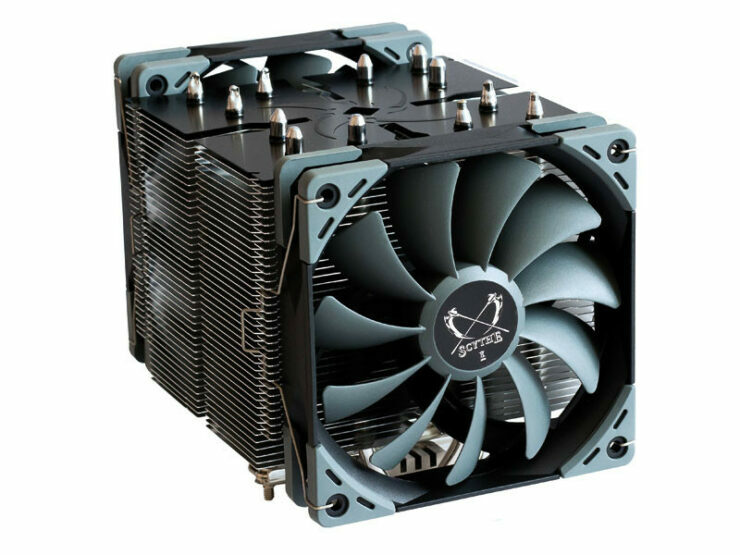 All mounting clips, one screwdriver, two Kaze Flex 120 PWM fans with clips, thermal grease, the user manual and one PWM-Y adapter are supplied with the Ninja 5 CPU Cooler. Scythe Ninja 5 (Model No. 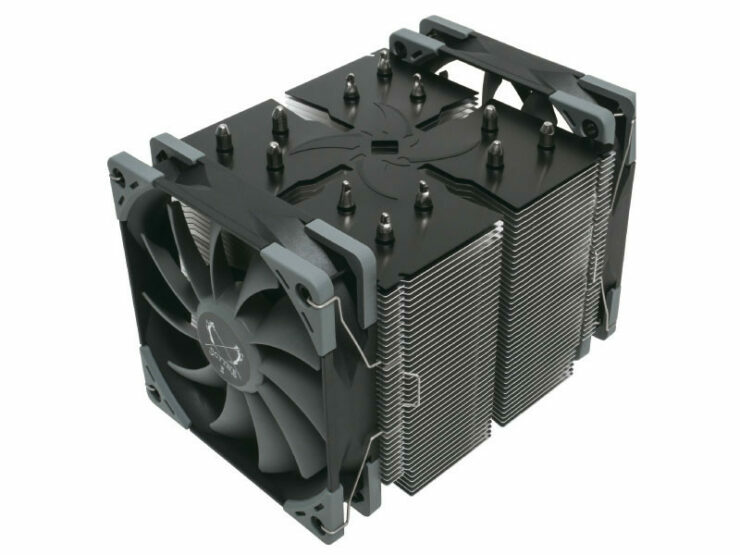 SCNJ-5000) CPU Cooler is available as of today and should be at your favorite retailer soon. Suggested retail price is set at 45.00 EUR which the exchange rate to USD is about $55.